ISLAMABAD (AP) — Pakistan’s Interior Ministry said Tuesday that authorities arrested dozens of suspects in the wake of last month’s suicide bombing in Indian-controlled Kashmir that killed 40 Indian troops, including the brother of the leader of the outlawed Jaish-e-Mohammad militant group. The arrests were apparently aimed at easing tensions between Pakistan and India that escalated after the Feb. 14 suicide attack. In Tuesday’s statement, the ministry said authorities arrested 44 suspects, including at least two prominent members of the outlawed militant group, which claimed responsibility for the attack that pushed the neighboring countries close to an all-out war over contested Kashmir last week. Among those arrested was Mufti Abdul Rauf, the brother of the group’s leader, Masood Azhar. According to the ministry, Rauf was among a list of suspects in a file on last month’s bombing that India gave to Pakistan over the weekend through diplomatic channels, urging Islamabad to take action against suspects linked to the killing of its soldiers in the region, which is split between Pakistan and India and is claimed by both in its entirety. Also detained was Hammad Azhar, the brother-in-law of Masood Azhar. At a news conference Pakistan Interior Secretary Azam Suleman Khan said Pakistan will take further action against suspects linked to the attack in Indian Kashmir if New Delhi provides additional evidence to Islamabad. “So far India has not given evidence,” he said. “We received only some names” in connection with the suicide attack. He said the 44 suspects detained across the country belonged to a number of groups, not just Jaish-e-Mohammad. Tuesday’s arrests were announced hours after Pakistan’s navy claimed that it spotted and warned an Indian submarine approaching its territorial waters in the Arabian Sea not to attempt an incursion. The navy said in a statement that the Indian submarine wasn’t targeted, “keeping in view Pakistan’s policy of peace” under which Islamabad wants to de-escalate tensions with New Delhi. A navy official said the warning was “communicated” to the submarine during Monday’s encounter. The submarine then moved away. The official didn’t elaborate and spoke on condition of anonymity to talk to reporters. In India, a spokesman for the navy, Capt. D.K. Sharma, said on Twitter that the navy “remains deployed as necessary to protect National Maritime Interests.” Over the past several days we have witnessed Pakistan indulging in false propaganda and spread of misinformation,” he said. 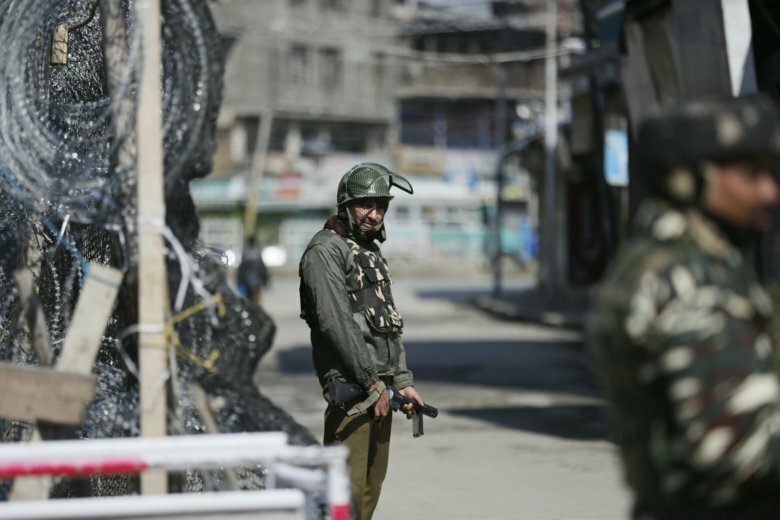 Still, an uneasy calm prevailed Tuesday along the Line of Control, which divides Kashmir between Pakistan and India, and which saw an intense exchange of fire between the two nuclear-armed rivals last week, killing several people and at least two Pakistani soldiers. Tension between Pakistan and India increased last week when New Delhi launched a retaliatory strike in the northwestern town of Balakot, saying its air force hit a terrorist training camp and killed “a very large number” of militants. Pakistan said the strike only damaged three trees in a forest. However, Islamabad responded by shooting down two Indian warplanes and capturing a pilot, Wing Commander Abhinandan Varthaman, who was returned to India at the Wagah border near the eastern city of Lahore as a peace gesture. Since then, the two sides have exercised restraint amid calls from the international community for avoiding war. Associated Press writers Aijaz Hussain in Srinagar, India; Adil Jawad in Karachi, Pakistan; and Roshan Mughal in Muzafarad, Pakistan contributed to this report.